This section focuses strictly on Dynamics GP Security, you or your system administrator will learn how to manage users in the application, determine who has access to what functions, how to produce access lists for auditors, and much more. Some of the security items like User Security, Account Security, Field Security, Task Security, Report Writers and Security Best Practices will be available under the section. Here you will find the Why does Microsoft Dynamics GP encrypt passwords? and the excellent Microsoft Dynamics GP Application Level Security Series by David Musgrave along with other articles on security. Going into specifics under Field Level Security you will find a post on Simple Field Level Security by Steve Chapman. There’s also a great post on Audit Trail codes – different prefix’s in different companies Microsoft Dynamics GP by Ian Stewart. How do I find out the password policy when using Advanved SQL Server Options? How to identify idle GP sessions – when you’re trying to manage your users!! 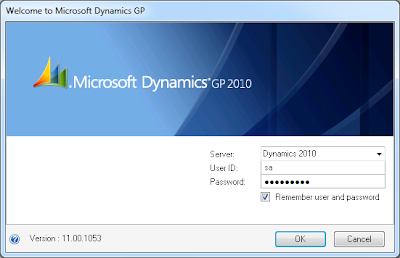 How to reset Microsoft Dynamics GP System Password??? Mariano detailed the security enhancements in GP 2010, checkout his post HERE. Mariano Gomez takes a look at security enhancements in the GP 2010 beta in his latest post. This article opens the series on the new features and enhancements available in Microsoft Dynamics GP 2010. I will start out with something dear to the heart of systems administrators and that's security. So let's take a look at the first set of enhancements that have been introduced to the new release. Now you have the option to log on to Microsoft Dynamics GP and a default -- favorite if you will -- company automatically. In order for the login to take place automatically, the system administrator must mark the Enable Remember User field in the System Preferences window. You will notice a new checkmark on the Welcome to Microsoft Dynamics GP window to Remember user and password. Where possible I will also show how using the Support Debugging Tool for Microsoft Dynamics GP can make the process simpler and quicker. Recover “Not Reset!” the System Password!?!?!?!?!?! We’re quite familiar with this phrase in almost all websites across offering us to store our usernames and passwords so that when we try logging in next time, we just don’t need to enter them again and again thus freeing our time little more. Surprisingly, Dynamics GP 2010 has got a feature similar to this option. In fact, It has not just one but two such options. 1. Remember user name and password – This option when marked, the GP client doesn’t ask you for your credentials and push you to the next screen, Company selection.